Whitehall L-90-M Mobile Whirlpool is recommended for treatment of extremities, hip and back area and allows space for exercising. 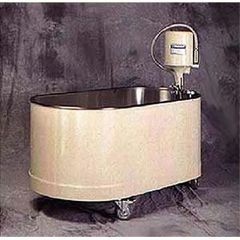 Whirlpool Tank is 60”L x 24”W x 18”D and is seamless welded construction, fabricated from heavy gauge, type 304 stainless steel, polished to a satin finish. Tank rim is reinforced with a concealed stainless steel rod. Tank is fitted with an auxiliary drain valve. Tank bottom is a seamless, rounded covered design to minimize bacteria buildup. Heavy Duty Swivel Casterssupport all mobile models. Rear pair of casters are lockable for stabilizing whirlpool during treatment.